Columbia, Mo. 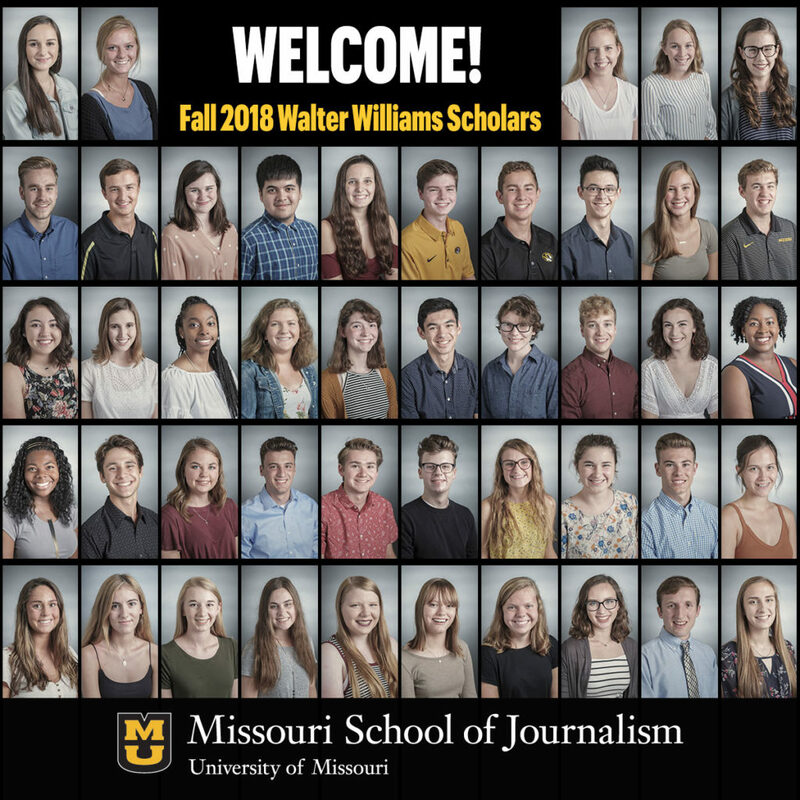 (Aug. 31, 2018) — The Missouri School of Journalism welcomed 50 new Walter Williams Scholars on Wednesday, Aug. 29. The students come from 16 states across the country. To be considered for the Walter Williams Scholars program, candidates must be incoming freshman with a score of 33 or higher on the ACT. This class of Walter Williams Scholars holds a variety of journalistic experience, with nine students who served as the editor of their high school newspaper or magazine. Many students lettered in sports and/or were captains of their teams, two were president of student government, and three are Eagle Scouts. The Walter Williams Scholars Program, named for the School’s founding dean, accepts freshmen by invitation only. Once on campus, students receive renewable scholarship funds directly from the School of Journalism, are placed in a special Freshman Interest Group, are assigned a personal faculty mentor, receive a $1,000 scholarship to study abroad or in the School’s programs in New York City and Washington, D.C., at any time before graduation, and automatic admission to the one-year BJ/MA program, which allows students to complete their graduate degrees in one year rather than two. The program, designed for high-achieving University of Missouri freshmen studying journalism, is now in its 15th year. To date, 771 students have participated in this program. Gracie Alvarez from North Little Rock, Ark. Joe Butler from Ballwin, Mo. Kevin Cook from Carmel, Calif.
Tyler Driesenga from Allendale, Mich.
Hal Estep from Branson, Mo. Laura Evans from Leawood, Kan.
Jared Fisch from Cherry Hill, N.J.
Michael Fitzpatrick from Arlington Heights, Ill.
Connor Giffin from Foster City, Calif.
Shelby Henderson from Bolivar, Mo. Hannah Holladay from Overland Park, Kan.
Kyndall Hubbard from Chantilly, Va.
Grace Keith from Monroe, Wisc. Lianna Kowalke from Reinwald Gurnee, Ill.
Lily Kraxberger from Columbia, Mo. Ian Laird from Seattle, Wash.
Skylar Laird from Saint Peters, Mo. Jonathan Larimore from Warrensburg, Mo. Ellie McCrary from Wentzville, Mo. Katelynn Mcilwain from Freeport, Ill.
Spencer Mende from Nixa, Mo. Emma Moloney from Rocheport, Mo. Andrew Moore from Rockton, Ill.
Jake Mosher from Saint Charles, Mo. Evan Musil from Olathe, Kan.
Madalynn Owens from Columbia, Mo. Rachel Pickett from Overland Park, Kan.
Jacob Reed from Centennial, Colo.
Holly Roustio from Independence, Mo. Madison Ryley from Plainfield, Ill.
Hannah Sherrow from Chillicothe, Mo. Nikol Slatinska from Columbia, Mo. Anna Spell from Columbia, Mo. Caroline Stiefbold from Mt. Prospect, Ill.
Delanie Vinzant from Maryville, Mo. Abby West from Weston, Conn.
Allie Widick from Lee’s Summit, Mo. Madeline Wilson from Fulton, Mo.